With the recent launch of Sage Inventory Advisor, you now have access to affordable cloud-based software that’s helping companies reduce excess inventory and working capital while eliminating stock-outs. Let’s take a closer look at this new and unique add-on solution for Sage 300 ERP (Accpac). What is Sage Inventory Advisor? 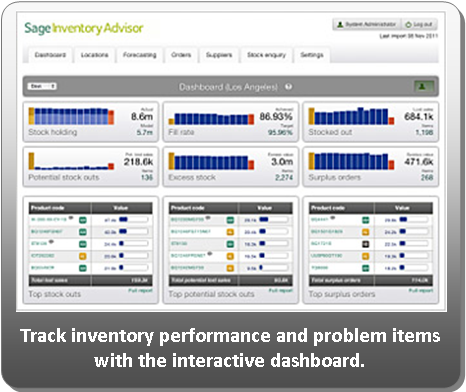 Sage Inventory Advisor is a web-based application that connects to Sage 300 ERP, crunches the numbers, and delivers a real-time health-check on your inventory. Leveraging the power of a sophisticated forecast engine, it delivers data and insight that helps determine the optimal investment required to achieve target fill rates. You can access Sage Inventory Advisor using an internet browser or mobile device. The graphical, web-based dashboard displays key performance indicators (KPIs) so you can quickly identify problematic inventory items, and then drill into the underlying data for deeper insight. Sage Inventory Advisor will also monitor inventory status and provide early warning for critical items such as inventory out of stock, or near out of stock, as well as excess and surplus orders. You also benefit from features like supplier performance tracking, order scheduling so you know when and what to order, and order management to review and amend existing orders. Interactive Dashboard - provides visibility to critical KPI’s and analytics such as stock holding, stock outs, potential stock outs, and excess stock and surplus orders. Lists top items requiring immediate attention and allows drilldown to details in your ERP system. Inventory Monitoring - early warning of potential stock-outs or surplus orders. Classification Matrix - classifies items into nine color-coded categories based on calculated metrics such as velocity (times sold), quantity sold/consumed, and value of sales/consumption, allowing you to quickly identify and focus on important items. Order Scheduling and Management - shows what orders to place based on item policies (stock levels, forecasts, etc.) and provides view of recommended new orders (by supplier) to place for the day. Also provides ability to amend orders and send them back to the Sage 300 ERP for processing. Supplier Performance - shows supplier performance through relevant charts. Helps user identify good or poor performers and plan purchasing accordingly. Assists user in setting dynamic safety stock based on supply risk. It’s important to note that Sage Inventory Advisor does not replace your existing 300 inventory module which is still used to manage day-to-day inventory transactions. Instead, it complements your existing functionality, adding advanced forecasting and planning features that work hand-in-hand with the supplier, inventory, sales, and purchasing information in your Sage 300 ERP database. Sage Inventory Advisor is offered as a monthly subscription service with the monthly rate determined by the number of SKULs. Since it’s a cloud-based solution, there is no hardware or server purchase and configuration required. In fact, you can be up and running on Sage Inventory Advisor in just a few hours! Contact us for a quote, to register for a web demo, or to learn more about Sage Inventory Advisor!